Turns out, green fuels are rocket science. Space exploration may have given us pictures of our pristine, blue planet Earth and raised awareness to protect our environment, but that’s no good if the rockets that get us to orbit are based on old, toxic propellants. 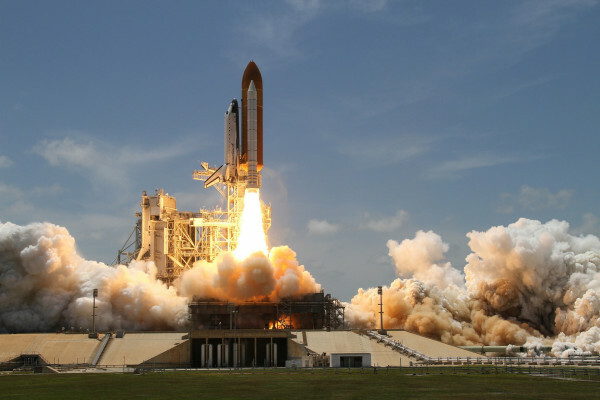 For decades, the most common rocket propellant has been hydrazine, a toxic compound of nitrogen and hydrogen that is on the EU’s list of substances of high concern. It is also the suspected cause of abnormally high rates of hormonal and blood disorders around the Baikonur rocket launch site in Kazakhstan. That’s why scientists at the German Aerospace Centre (DLR) in Lampoldshausen are working on new, greener fuels that can future-proof space exploration methods and make them environmentally friendly. The efforts are centred around a compound known as ammonium dinitramide (ADN), which when heated decomposes into only nitrogen, oxygen, and water. ‘ADN was an oxidiser salt first found in the Soviet Union, but was rediscovered in Sweden in the 1990s where they had the idea to develop it into a liquid propellant,’ said Dr Michele Negri, leader of a space propulsion project called RHEFORM. The problem is that ADN is a salt, so it is solid. While it can be dissolved into other fuels like methanol or ammonia, it takes a high temperature - more than 1500ºC - to ignite it. ‘Hydrazine thrusters do not require pre-heating, if you just open the valves then they start firing. On the other hand, with an ADN thruster if you just open the valve the blend would come out in liquid form. It would not react,’ Dr Negri said. The RHEFORM project looked at the ADN-based propellant LMP-103S used by a Swedish space company called ECAPS, which was a project partner and has already launched 13 propulsion systems based on the compound. To tackle the problem of easy ignition, the project looked at developing a better, more reactive catalyst so that the fuel could react at room temperature. Hydrazine followed the same path of early development. ‘At the very beginning in the ’60s they were not able to fire at room temperature, but then they developed a catalyst that was good enough,’ Dr Negri said. After testing many materials, the rocket scientists found out that hexaaluminate would make the best base material. But what if simple pellets could be improved to have an even more ideal surface area to make them more reactive? To find out, they used computer modelling and 3D printing to create complex honeycomb-like structures known as monoliths, and so increasing the surface area. ‘This basically was done in the automobile industry (in creating catalytic converters), replacing the pellets with a monolithic structure. With the know-how the of our project partner (3D printing company) LITHOZ, we were able to print very complicated structures in ceramic, and then use that as a catalyst,’ Dr Negri said. Dr Negri says that the next step for achieving room temperature ignition of ADN probably would be using propellants which do not contain water. Water makes propellants more stable, and safer to ship, but it also makes them less reactive. ‘You can play a lot with the composition to find a good trade-off between different factors, for example performance, like specific impulse, storability, or explosivity,’ he said. In addition to being greener, ADN could also be cheaper. ‘Fuelling a satellite with LMP-103S is a lot easier than hydrazine, since by the first launch you have spent just a third of the manpower needed for the more hazardous hydrazine,’ he said. Even if the propellant is a little more costly, the total life cost could be lower, Dr Negri adds. US space agency NASA, which was not involved in the RHEFORM project, agrees that there is a need for greener rocket fuels and is working on a safer-to-handle propulsion system.